Cover image: The ATLAS Barrel Toroid Magnet, so enormous that a human is dwarfed at its center. 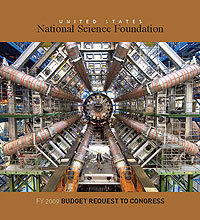 The National Science Foundation proposes a Fiscal Year 2009 investment of $6.85 billion to advance the frontiers of research and education in science and engineering. The Budget Request includes an increase of $822 million (14 percent) over the FY 2008 level. These NSF investments in new knowledge and talent development are vital to advance the frontiers of discovery and to ensure that America remains a global leader in science and technology. The Administration and Congress have conveyed their clear determination to build on America's history of success in leading-edge discovery and innovation through increased federal investments in research and education as evidenced by the President's American Competitiveness Initiative (ACI) and the America COMPETES Act of 2007.